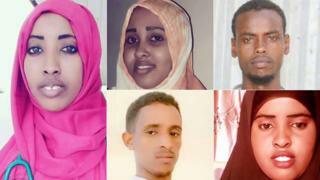 A Facebook page has been set up to help identify the victims of Somalia's deadliest terror attack in a decade as well as those still missing. A lorry full of explosives destroyed hotels, government offices and restaurants at a busy junction in the capital, Mogadishu, killing at least 281 people and injuring another 300. Somali authorities are struggling to identify the dead - leaving relatives helplessly searching for news. Photos are accompanied by brief information about where the person was last seen with a number to call should anyone have information. The team, which has the backing of the government, is also posting the names of those who are being treated in hospital. It is unlikely we will ever know the identities of everyone who died in the 14 October Mogadishu attack. But this is what we know so far. A medical student at Benadir University in Mogadishu, Maryam Abduallahi, 25, was preparing to graduate on Sunday. Her father, who lives in the UK, had travelled especially to Somalia for her graduation, but ended up attending her funeral. Maryam's sister Anfa'a Abdullahi Mohamed told the BBC Somali Service that she had tried to reach her sister after the explosion. "I called her number after the explosion, no-one answered. "Our family is saddened. My parents are most distressed. May God make their hearts strong," she said. Her older sister had been a role model who liked helping people at the hospital where she worked and at the university, she added. "She was planning to start training at a mother and baby clinic after her university graduation. She had ambition." Fa'iso Hassan Ali, 24, had a shop next to Safari Hotel, which was destroyed in the explosion. Called "Mama Halima", the shop was totally demolished. Her family have been looking for her since Saturday. Omar Haji Mohamed has appealed for information about two of his children, a son and daughter, who are thought to have died in the explosion. They were at the family's shop in Soobe, the area where the attack happened, and have not been seen since. Mr Mohamed has been moving between hospitals and help centres, but has not found them amongst the injured. A public transport conductor, Suleiman Nuur Ali, 29, had been at work on Saturday in Soobe. He has not been seen since the attack. "Please if you get him dead or injured, contact us," a message from his family says. Bureeqo Abdullahi Adan, 17, was known to be travelling on a bus when the blast happened. Her relatives are asking for any information. Abdi Abiid was also last seen in Soobe. The area is near Somalia's CID headquarters and foreign ministry. His family have not heard from him since Saturday. According to the director of a Mogadishu ambulance service, 15 primary school children were among those who died. Abdulkadir Adam told the Associated Press news agency that they had been on a school bus when the lorry exploded. Freelance cameraman Ali Nur Siad was killed while working for Voice of America, the news agency has said. "On behalf of the entire agency, my deepest condolences go out to Mr Siad's family," said VOA Director Amanda Bennett. VOA reporter Abdulkadir Mohamed Abdulle was among those wounded in the attack. He suffered a broken hand, widespread burns and shrapnel wounds to his head and neck. He is receiving medical care in Turkey, the agency said. Amid all the sorrow and despair, Gurmad252 has found some good news to share. A young woman who had been reported missing has been found alive.